I traveled to Washington D.C. this past week for business, and it was a wonderful experience. The last time I spent any significant time in Washington was as a ten year-old safety patrol participant on a jam-packed 5 day trip. I remember seeing various sights, most of them briefly, but the capital didn't have the impact on me then that it had this last week. 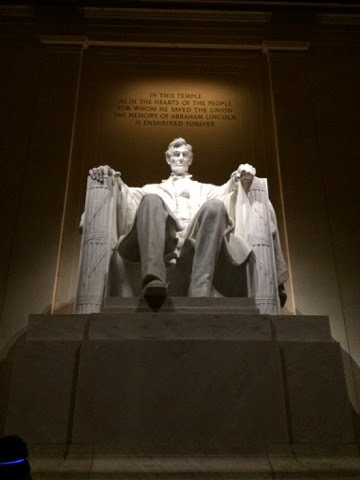 Much of my time there was in meetings, but each day I was able to experience something unique to the city, whether it was the monuments on the National Mall, some of the Smithsonian institutions, or the U.S. Capitol Building. It's not just the physical element that impresses me, but what they represent, in some instances the pinnacle of human achievement. We know that, due to our frailties, we are "less than the dust of the earth." Why? Because the dust responds to God's commands, and we do not (Helaman 12:7-8). We alone employ our will to our own ends, often in defiance of God's law. This is a two-edged sword. At times, our defiance results in unspeakable evil, ugliness, and brutality. Sometimes it leads to mediocrity which, while not malicious, falls far short of our potential. Sometimes however, we achieve greatness. I saw some of that this week. Magnificent buildings, extraordinary artwork, monuments commemorating the great sacrifices made by millions of our countrymen, and incredible technological advancements enabling flight and space exploration. I couldn't help but be inspired and uplifted. A key element of my faith is the idea that each of us can progress eternally, eventually becoming like God and Jesus Christ. At the same time that I recognize how far I am from that objective, I know that God intends greater things for me. It helps me to remain humble, even when I appreciate some of man's greatest accomplishments, among them the creation of our country. When man measures himself against the infinity of the cosmos he is almost nothing, "hardly a mote in the sunbeam." But when he measures himself against Christ, who overmasters all of these worlds and world systems, and realizes his kinship to Christ, all diminutives become superlatives. The more man comprehends the vastness of the universe, the more he recognizes his own dignity and worth. The cosmos is God's temple. But man is his offspring--a living temple, given dominion over the rest. Labels: Church of Jesus Christ of Latter-day Saints, Excellence, LDS, Mormon, Religion, USA, Washington D.C.